You can’t blame them for trying that. In the early 1990’s, the food pyramid–as we were all made to believe–emphasized that the largest chunk of our diet should be allotted to breads, cereals, rice, and all that starchy stuff. However, we now know that these guides were also influenced by government subsidies, and economic factors–hence the push for this food group. According to the Harvard School of Public Health, “Intense lobbying efforts from a variety of food industries also helped shape the pyramid and the plate.” I have no doubt that this happens locally too, especially that we are a rice-producing country. Today, healthy eating proportions have been redesigned–not without controversy–and now show that only a fourth of our plate should be allotted to whole grains like wheat, rice and pasta. Whole grains. Filipinos, in general, eat too much rice. When you try to enlighten someone, the instant reaction you’d get is, “I can’t live like that, I’ll die without my daily cups of rice.” Nope. You can’t live like that. If we continue with the “Extra rice is life,” mantra, you probably won’t…live…that long. Cue diabetes in. As soon as you warn them about the risks of diabetes, you get, “Di naman ako mahilig sa matatamis.” (I’m not fond of sweets.) Or, “I don’t use sugar na.” Yes it’s about sugar but it’s NOT just about added sugar. Rice is carbohydrates, and carbs turn into sugar. Several years, Readers Digest articles, and a couple of type 2 diabetes diagnoses later, my parents re-evaluated food. My dad threw out the sugar-laden “fruit juices,” started buying whole wheat breads, and they tried out low-carb diets. I was in high school. The thought that diabetes is hereditary and that both our parents are officially diabetic, had sort of ingrained in us (my siblings and I) the idea that sooner or later, we’d all join them in the ranks of diabetic people. I mean, shouldn’t we just consider ourselves pre-diabetic this early on, and adapt a lifestyle change? Easier said than done. As with most things that break the norm, it’s a choice. Did my parents get judged for letting their teenagers try a low-carb diet? They probably did. Did friends feel sorry for me when they saw me eating kare-kare without rice? Yep, sure did. Do people around us silently scoff at the low-carb lifestyle we’re trying? Oh yes, they do. Do I get the “wow, pa-healthy!” comment on my food choices? I still do. But it’s a choice they made; it’s a choice we made. the question is, do you want to be the first one? My longest streak on a no-rice diet was two years. I was 21. While the suggested healthy eating plate does not eliminate grains, two years without rice taught me that not relying on it was survivable. I can never default to the “I can’t eat ___ without rice” excuse. Adobo too salty? Make it with less salt/soysauce. Kare-kare too rich? Don’t slurp the freaking sauce. You didn’t cook the food? Get more vegetables than meat. At a restaurant? Ask if they can go easy on the spices, or have the sauce on the side. So, are you eating too much rice? We have to start understanding that rice isn’t–and shouldn’t be–the highlight of the meal anymore. 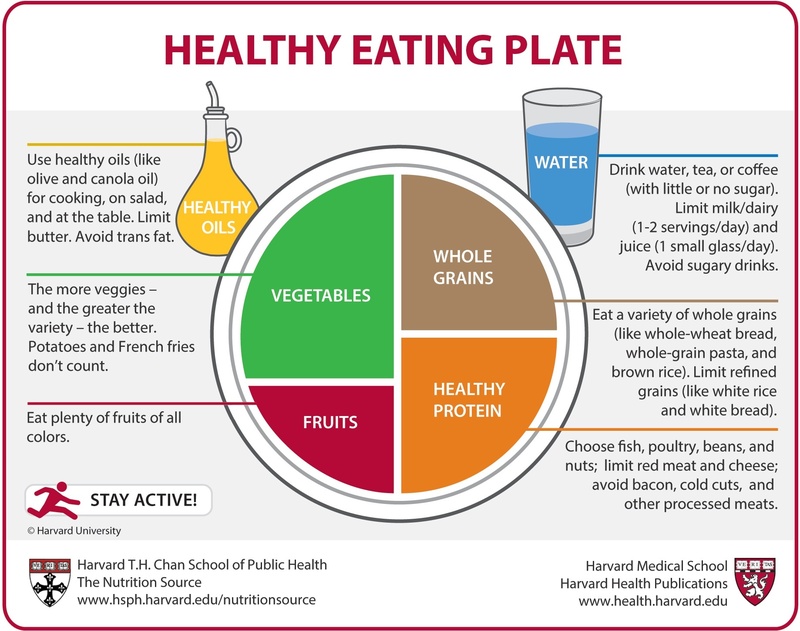 Half of our plate should be filled fruits and vegetables (reiterating: potato doesn’t count!) We won’t “have less energy” because we get carbohydrates from the other food groups, too. Remember the part where it said Whole Grains on the eating plate diagram? Whole grain breads, rice and pasta have more fiber and are therefore more filling. Those options also have lower glycemic indexes than refined grains (white bread, white rice, etc.) meaning it digests slower, keeping you full for a longer time. We also noticed that there is more effort in chewing brown rice over white. That does make you eat slower, and less. Despite being more expensive than white rice, A and I have been consuming brown rice for a couple of years now. We don’t exclusively eat brown rice, but if I’m cooking, or if a restaurant had the option, we go for brown. Maybe we switched to deter us from having more rice, or just so that we’d have that psychological reassurance that we’re trying to eat healthier. Either way, brown rice has helped us regulate our rice intake. Months turned to years; we got so used to brown rice that we now feel how much more refined (slightly bordering feeling like fake food) white rice is. I’m serious. The difference–the only comparison I could think of–is it’s like drinking Milo versus a cup of hot tsokolate de batirol (hot chocolate traditionally made with tablea). And because you don’t need much brown rice to fill you up, our typical daily rice intake is half a cup per person, during lunch. (We have salads or sandwiches using whole wheat bread for dinner.) A kilogram of uncooked brown rice lasts up to 3-4 weeks. This is not to show off to the world, hey I’m doing this, I’m better at this than you are. I wrote this post primarily with the intention to confirm and affirm: It’s doable. It’s possible. You should eat less rice. It will still let you enjoy your favorite ulam, believe me. All you need is a conscious effort in portion control, and be aware that there’s a ginormous selection of fruits and veggies you can add to your plate! Brown Rice for Weight Loss? The point of this post is not to eliminate rice and all carbohydrates. It’s about regulating our intake, and not indulging in Mang Inasal just because they serve unlimited rice. Switching to brown rice is much healthier, but will it help you lose weight? Let me tell you now, choosing brown over white rice will not automatically make you lose weight: if you eat more than what you’re supposed to, you won’t. If you consume the same amount of brown rice as you’d normally do with white, that scale won’t budge. If there’s anything we learned from Intermittent Fasting, it’s that we eat too much. You can eat less and still live, function, and be healthy. And if you’re thinking: I’m buff, I exercise, I’m fit. I don’t need to eat less. Know that looking good doesn’t always mean you’re healthy. After all, you can’t outrun a bad diet. Rice isn’t everything. Rice isn’t all there is. You need more vegetables. I liked your story and I am also trying to eat less rice. However, I found the Philippine food names a bit daunting since I don’t know what they mean. So please can you explain what Kare Kare, Ulam and the rest are? Thanks. Now let me go to my latest blog post and edit all those Nigerian food names that might floor my readers. Ciao! Growing up in the states, mom made sure every meal has rice. It’s quite difficult to break up with rice considering the relationship is deep and lengthy lol. It is comfort food after all. With the advent of healthier eating, I started substituting caulirice for rice. It took a bit of getting used to (the texture just doesn’t come close). After a while, we noticed we don’t miss rice anymore! PS. I have an extremely hard time reading/speaking Tagalog even though I can understand it fluently. I’m glad to hear about your switch to caulirice! Cauliflower is a bit expensive here in Manila so I guess that won’t really fly here, unless in more expensive restaurants. It’s really so hard to break the rice mentality especially if everything you see here is served with a cup of rice! Great job to you guys!